Later I'll share my side table. That's it for now, Thanks for stopping by. I'll be joining these great parties this week. I love your all white arrangement! I don't have a mantle either so I use the bookcase in my living room to showcase my pretties! Just realized you were from NJ, I'm not too far I guess in SE PA! There is nothing simple about this. It has depth and heights and textures, and most of all it is beautiful! Your white looks so pretty, simple and elegant all at the same time. I really like how the all white looks. That was a wonderful idea to paint the luggage white. It really adds a nice mix yet it all ties together. So beautiful my friend. I love how simple you kept it. I don't have a mantle either so I use my sofa table and an armoire I have in my entry to change with the seasons. I love the all white Fall look. Very creative and such an elegant vignette. Thanks for sharing and leaving a comment on my blog. I found you on Pinterest! What fun we can have sharing ideas. Beautiful! I love the all white! Love it--the whites are quite beautiful. I don't have a mantle either. Love your decor!! Love white. Your rooster is pretty! I would love if you link this to the French party on Monday on my blog. That looks very pretty, Karen! I love that little suitcase and how you used it to raise the one pumpkin up. I have a mantel but it is kind of narrow for decorating, so I just add a few pumpkins in to my regular decor. I did decorate the piece we use as a sort of buffet in our dining area. That probably has more decorations than the mantel! Very pretty ! Love the white ! Beautiful vignette! You always put together such lovely displays on your buffet! Very pretty, love the white rooster included in the arrangement! Great look ... gives me some inspiration as what to do with my "all white" stuff. This all white is SO pretty--all white but completely seasonal--nicely done! Thanks for sharing today. So very pretty and a nice change from the typical fall mantel of bright colors. White is so beautiful, love this! I have been bringing in more white in my home! First time here, will be back to see more of your blog. Thanks so much for stopping by♥ Love all that you do! Perfection in white! So simple and elegant and a new statement on fall! Now I'm tempted to pull out the white spray paint and paint all my fall decorations! Gorgeous! I love the white! I'd like to invite you to share this at my party, Twirl & Take a Bow at www.houseontheway.com. I think it would make a great addition to the party! This is such an elegant look for your buffet, Karen. I love that you painted that suitcase--what a great idea to change out the look but keep the character of the piece! Both the mirror frame and the window frame are gorgeous as well. I love your all white fall decor. What a great idea. Love the pumpkins especially. I am visiting from Centsational Girl. I would love for you to come and link up to my Fall into Fall party that opens tonight at 8pm EST. Hope to see you there. Gorgeous! I love all the whites for your fall decor. Beautiful, I love all the white. Linked over from DIY by Design - LOVE, LOVE the white color scheme. The little piece of luggage is the perfect touch. I don't have a mantel either, but substitute a sofa table for my changing vignettes. Ok that does it . . . I'm doing all white next year. Just beautiful! Love the all white theme. It's classic and elegant. I have been seeing this all over ;) You sure did a gorgeous job on this vignette!! 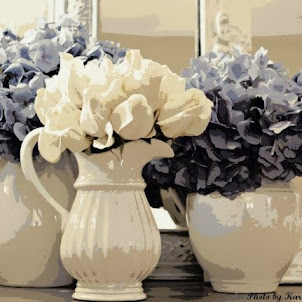 Karen your white vignette is absolutely gorgeous! What a beautiful concept. I would have never thought of white as the theme color. Very beautiful and creative.